1 ESGE suggests the routine use of high definition white-light endoscopy systems for detecting colorectal neoplasia in average risk populations (weak recommendation, moderate quality evidence). 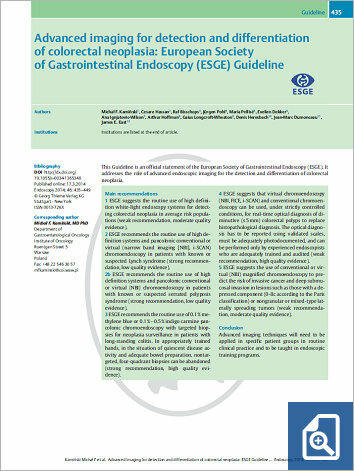 2 ESGE recommends the routine use of high definition systems and pancolonic conventional or virtual (narrow band imaging [NBI], i-SCAN) chromoendoscopy in patients with known or suspected Lynch syndrome (strong recommendation, low quality evidence). 2b ESGE recommends the routine use of high definition systems and pancolonic conventional or virtual (NBI) chromoendoscopy in patients with known or suspected serrated polyposis syndrome (strong recommendation, low quality evidence). 3 ESGE recommends the routine use of 0.1% methylene blue or 0.1%–0.5% indigo carmine pancolonic chromoendoscopy with targeted biopsies for neoplasia surveillance in patients with long-standing colitis. In appropriately trained hands, in the situation of quiescent disease activity and adequate bowel preparation, nontargeted, four-quadrant biopsies can be abandoned (strong recommendation, high quality evidence). 4 ESGE suggests that virtual chromoendoscopy (NBI, FICE, i-SCAN) and conventional chromoendoscopy can be used, under strictly controlled conditions, for real-time optical diagnosis of diminutive (≤5mm) colorectal polyps to replace histopathological diagnosis. The optical diagnosis has to be reported using validated scales, must be adequately photodocumented, and can be performed only by experienced endoscopists who are adequately trained and audited (weak recommendation, high quality evidence). 5 ESGE suggests the use of conventional or virtual (NBI) magnified chromoendoscopy to predict the risk of invasive cancer and deep submucosal invasion in lesions such as those with a depressed component (0-IIc according to the Paris classification) or nongranular or mixed-type laterally spreading tumors (weak recommendation, moderate quality evidence). Advanced imaging techniques will need to be applied in specific patient groups in routine clinical practice and to be taught in endoscopic training programs.